The food industry can be very dangerous, as it exposes workers to powerful machinery and many potentially hazardous materials. Whether you work in a food production plant, in the kitchen of a restaurant or as a delivery driver or caterer, there is a real chance of injury that you face on a daily basis simply for doing your job. The Chicago workers compensation attorneys of Rosenfeld Injury Lawyers LLC defend the rights and protect the interests of workers who have been injured on the job, regardless of whether the accident was the victim’s fault or not. If you have been harmed at work, it is important to understand your rights. There are many different types of jobs available within the food industry, from factory positions to food preparers to wait staff to janitorial positions to delivery jobs. All of these positions pose specific risks to employees and some of the common injuries our Chicago work injury lawyers encounter include the following. 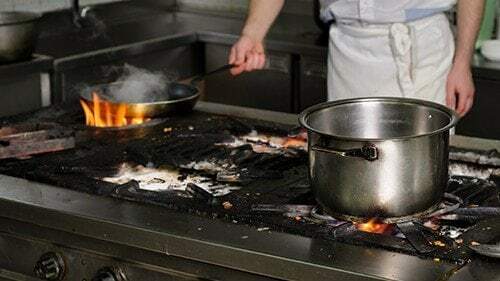 Kitchen accidents— food preparers and cooks often work long hours in the kitchen, where they are exposed to ovens, stoves and sharp knives used to prepare and plate food. All of the equipment used poses a risk to workers and can cause serious injury in the event of an accident. Food processing injuries— workers at food processing facilities often operate large and powerful machines. Whenever an employee operates manufacturing equipment, there is the potential for injury if he or she places a hand or foot where it can be caught between moving parts. Repetitive use injuries— many workers in the food industry perform the same task over and over again, which may cause injuries over a long period due to repetitious movements and strain. Delivery driver injuries— delivery drivers may be involved in car accidents or be injured in encounters with customers. Thieves and muggers often target delivery drivers in the hope of catching them with a large amount of money. Restaurants are required to insure all of their drivers behind the wheel and have appropriate worker’s compensation insurance to cover any other type of injury. If you or a family member was injured while working as a food prep, you are likely entitled to workers compensation benefits. Contact the workers compensation attorneys at Rosenfeld Injury Lawyers LLC for more information and a free review of your legal rights and options. It is important to understand that you are entitled to compensation any time you are injured while performing your duties on the job, even if the accident was entirely your fault. Worker’s compensation laws require every employer to maintain insurance that will cover the cost of employees’ medical expenses and a portion of their wages throughout their recovery. The following is what you are automatically entitled to if you have been injured. You have the right to seek medical attention from the doctor of your choice. Your employer may have a preferred provider, but you may decide to see your own physician or a specialist and your employer is required to cover the full cost of your treatment. You are entitled to receive two thirds of your average salary during the time you are unable to return to work. If your employer is able to find work for you to do while making accommodations for your injuries, you may return to work. In the event you are permanently disabled, you may be required an additional lump sum payment to cover the loss of opportunity and lowered quality of life you are subject to due to your injuries. If your injuries have caused permanent impairment, there are other avenues available to recover compensation in addition to your worker’s compensation benefits. You may recover additional compensation if your employer acted in a negligent manner, such as failing to provide adequate personal protection equipment or safety training to employees. Violations of work safety laws may result in penalties and punitive damages. Should your employer attempt to deny you payment of your benefits, you may be able to claim additional compensation as a punitive measure to deter your employer from future violations. Rosenfeld Injury Lawyers LLC is a leading personal injury law firm that has represented thousands of workers injured in work place accidents. Roughly eight in ten employees injured on the job now seek legal representation to ensure that they receive the full amount of compensation to which they are entitled and we have the experience and knowledge required to recover the full amount of damages that the law will allow. Contact us today to arrange a free consultation with a lawyer so that we can let you know more about your rights and legal options. Our Chicago work injury attorneys work on a contingency basis so that we can provide award winning services to clients from all walks of life without any risk or financial stress. At no point will we ask for upfront attorneys’ fees and you are guaranteed never to owe us a thing unless we are able to recover compensation on your behalf.